Check out these awesome house cleaning tips to get your house cleaner with less work, in less time, and using only natural cleaning products, of course. Follow the guide below to completely clean your house from top to bottom, fast. This post is sponsored by Branch Basics and contains affiliate links. All opinions are mine. Cleaning hasn’t always been a specialty of mine. Keeping house was definitely a struggle, and has become rather a learned habit. Truly, I’m still a work in progress, but over the years living with my very clean husband, I’ve picked up a few things. Plus, constantly entertaining and having people randomly stop by, I feel pretty good at my housekeeping skills. Most days. I asked my 3-year-old for some house cleaning tips and she asked if we were having people over. Which we do at least once a week, so keeping a clean house is a must. Since the holidays are right around the corner, I thought this would be the perfect time to share some of my favorite house cleaning tips. 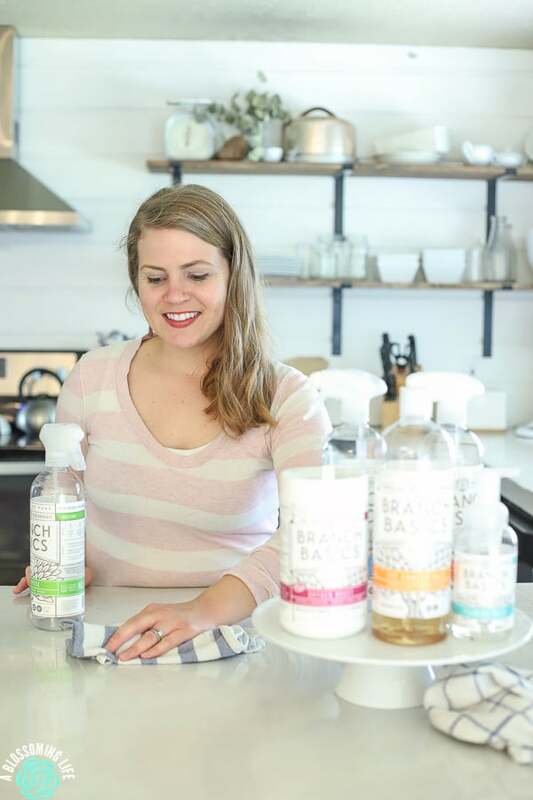 Many years ago, I switched to making my own natural cleaning products. I thought they worked pretty well; that was until I started using Branch Basics. I didn’t realize how much time I spent unnecessarily scrubbing because the homemade stuff just wasn’t cutting it. Literally. Branch Basics is tough on dirt, but safe and natural. One thing that is really important to our family is using safe products. Growing up, I had horrible asthma, and every time I would clean, it would flare up. It wasn’t until college that I put two and two together: that the products I was using was playing a huge role in my symptoms. Another thing to be concerned with is “fragrances.” This is a general term for hundreds of potentially toxic chemicals. The chemicals in “fragrances” have been shown to be endocrine disruptors and carcinogenic. Personally, I’m super sensitive to fragrances, and when I smell them, they make me nauseous and usually give me a headache. Even some so-called “natural” brands contain synthetic fragrances. 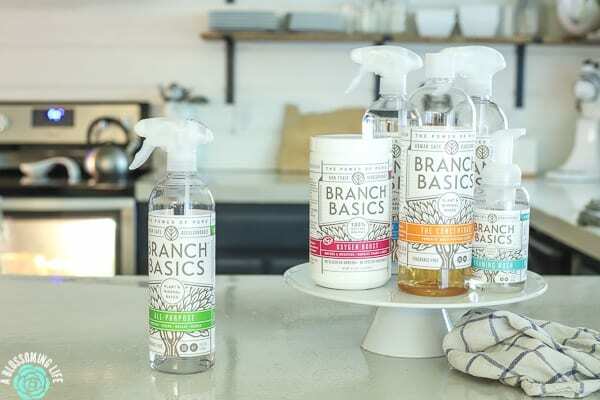 Thankfully, Branch Basics is completely fragrance-free and a natural cleaning product. The EWG gives both the Branch Basics concentrate and the Oxygen Boost an A, so I feel great about using it, both for me and my family. 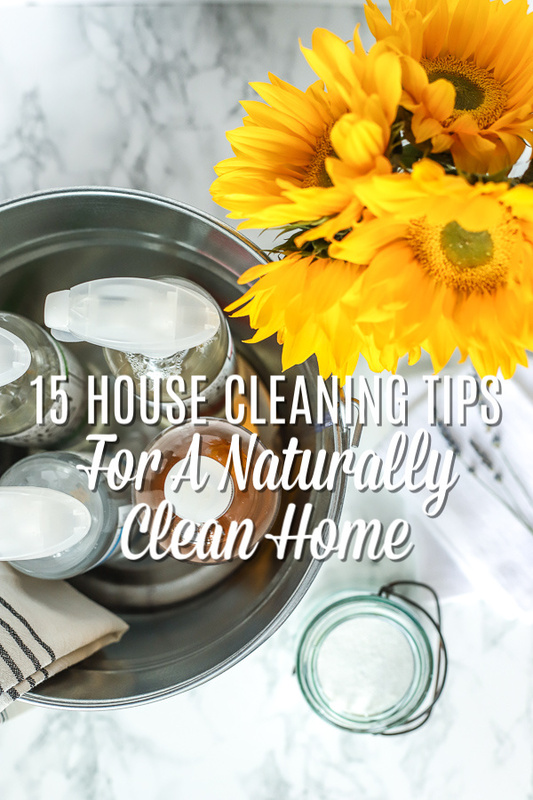 Grab your natural cleaners and follow these house cleaning tips to get a clean house fast! I don’t like to keep a bunch of stuff around the house, and that goes the same for cleaning products. I love how Branch Basics allows you to streamline and minimize the number of products you use. The concentrate can be made into different products to go from the bathroom, to the kitchen, to the laundry room. The concentrate makes an All-Purpose Cleaner, Bathroom Cleaner, a Streak-Free Glass Cleaner, laundry detergent, and even hand soap. Keep cleaning products all in the same place. I love carrying them in a caddy. That way, you can go from the kitchen to the bathroom to the living room to the bedrooms, all without wasting time to get different products. Just keep it all together and take it with you! If you are leaving a room, try to grab a few things to put away. When you are done using something, put it back immediately. In the bathroom, when you are done using the sink, wipe down the counter around it. This keeps water stains off the counters and leaves it looking cleaner between cleanings. When you have a lot of clutter, it can feel overwhelming. The more clutter you have, the more things you clean. Getting rid of unnecessary items will help keep the house cleaner, and when you do have to clean, it will speed up the process. Also, a lot of clutter could also mean more dust, which can contribute to worse allergies. You can see why I got rid of most of the kids’ toys here. Time is of the essence, so why not try to get all your house cleaning done in as short of time as you possibly can? This typically happens right before my husband gets home. As fast as I can, I run around, pick up, and straighten up anything that needs to be done, wipe down the counters, and spot sweep or vacuum. This one just may be one of my favorite house cleaning tips. I’m a big believer in having everyone help. During our power cleaning, I have my three year old help pick up room by room. She now can put dishes near the sink, her own clothes away and put her dresses on hangers. One day, she will be a big help, but right now I’m teaching her some basics. 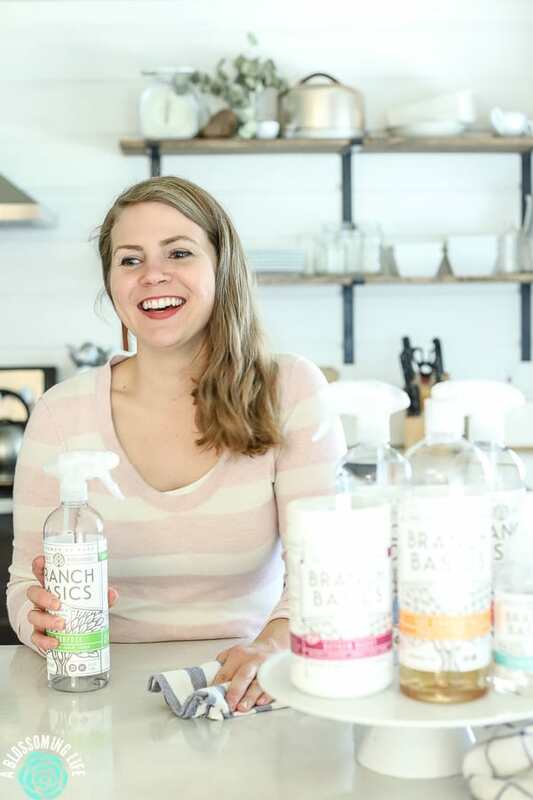 Since Branch Basics is a safe, natural cleaning product, August can help me spray down a few things (you know, the things a 3-year-old can reach) and wipe them down herself. It’s best to vacuum then mop last. That way when you clean and wipe off tables and counters, everything can fall to the floor, and then you can vacuum it up. They are much easier to get out right away than if you let them set. You can pre-treat stains using Branch Basics All-Purpose spray and the Oxygen Boost. Then wash with laundry detergent. Really tough stains should be soaked overnight. Sprinkle Oxygen Booster on tile grout and spray with bathroom cleaner. Allow to sit for a few minutes, and then scrub away to leave your grout bright and clean. When you take out the trash or those really stinky diaper pails, spray down the can with All-Purpose Cleaner and wipe it out to eliminate stinkiness. Clean shouldn’t really have a smell, but if you’re used to having a scent, it can be a hard adjustment. If you really want to add a natural fragrance, you can add a few drops of essential oil to a diffuser, or even into the cleaning sprays themselves. One thing I really dislike is when I go to change the sheets and bedding, and there isn’t a replacement. Make sure to always keep extra sheets and blankets ready to use. 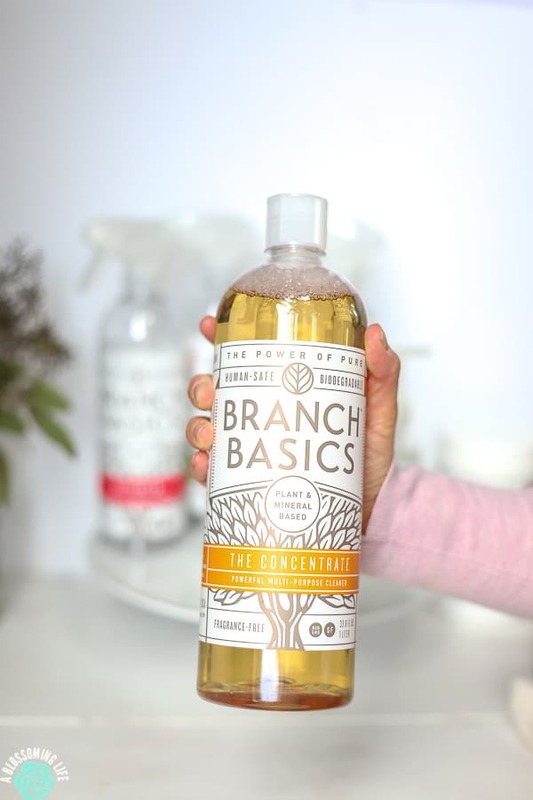 If you use Branch Basics laundry detergent, it will strip any previous unnatural detergent from fabric, which is great if you are trying to make the switch to living more natural. If you have a tough stain (fabric or carpet), or food particle that just won’t come off a table, simply spray the All-Purpose cleaner on the area and allow it to sit for 5 minutes. Then wipe away. Or in the case of a carpet stain, it’s always better to gently blot. The quickest and easiest way to clean house is by starting in one room and cleaning that room completely before moving on to the next. I like to do all my vacuuming at one time after all the rooms have been cleaned to cut down on time. Clean out the fridge and wipe down with All-Purpose Cleaner. Wipe down cabinets, inside and out, and any open shelving. Clean windows using Branch Basics Streak Free Cleaner. Use the All-Purpose Cleaner to wipe down vent hood and countertops. Vacuum and then mop using 1-2 oz of the concentrate per gallon of water. Make the bed and straighten pillows. Tidy up anything on the ground, including laundry left on the floor, and put things in their place. Dust with microfiber cloths – make sure to dust furniture tops, bed frames, window sills, and night stands. Clean with mirrors with Branch Basics Streak-Free Cleaner. Pick up clutter and straighten up pillows. Dust furniture, lamps, and decor with microfiber cloth. Spray bath and/or shower using Bathroom Cleaner and allow to sit for a few minutes– you can use the Oxygen Boost with the Bathroom Cleaner for extra scrubbing power. Next, clean the toilet so it can soak while you clean the rest of the bathroom. Spray the seat, inside the bowl, the lid, and the floor around it with the all-purpose cleaner. Sprinkle Oxygen Boost in the toilet and allow to sit for a few minutes. Then, using a toilet brush, scrub in the bowl. Wipe the top, lid, seat, and around the floor. I also like to use a paper towel and clean the inside under the ring of the toilet. Put away anything left out on the counter, and remove any unnecessary items. Spray down counters, faucet, and sink with All-Purpose Cleaner (if the sink is really dirty, I like to use the Bathroom Cleaner) and wipe clean. Go through cabinets and purge anything that you won’t use, is expired, or is broken. Get rid of all those random bottles of shampoo that have a tiny bit left. Replace towels with fresh ones and refill Branch Basics hand soap if needed. You have to find what works for you, but at our house, we straighten up every day, run the dishwasher at night and empty it in the morning, vacuum almost every day, and do our weekly cleaning one day a week. Do laundry everyday to keep up with it, or do it all on one day. Do bathrooms one day, dusting another day, and bedrooms another. Find a pattern and system that works for you and your family. Bonus Tip: You can use the concentrate to make personal care products like shampoo, hand soap, body wash, and makeup remover. There you go. Those are some of my favorite house cleaning tips. Leave a comment and share some of your favorite house cleaning tips below. Want More Natural Living Ideas? Check out these. Homemade Dry Shampoo is a staple in our house. 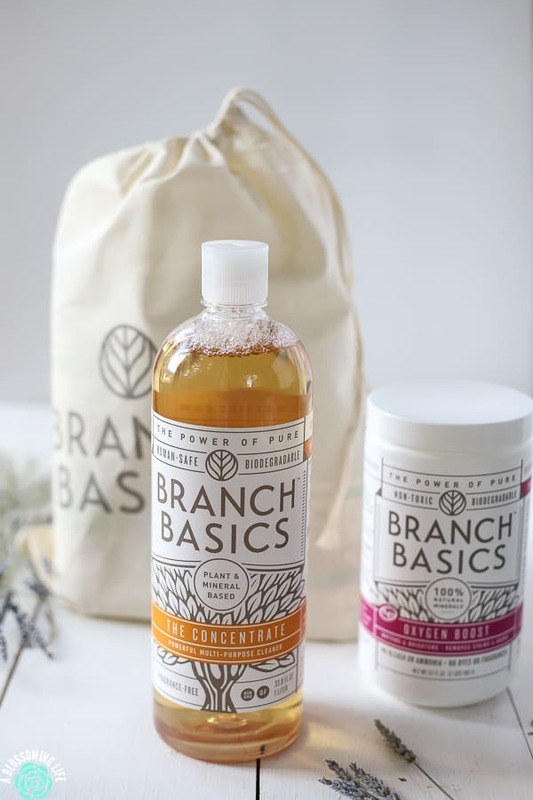 Thank you Branch Basics for sponsoring this post. Yes! Each bottle has a different concentration of the Concentrate and water. So the bathroom cleaner has a lot more concentrate than the streak free cleaner for heavy duty cleaning. Great tips and I will definitely use them for my next big cleaning. Thank you for sharing.